Not to be confused with PlayStation (console). The PSX is a Sony digital video recorder with a fully integrated PlayStation 2 video game console. It was released in Japan on December 13, 2003. Since it was designed to be a general-purpose consumer video device, it was marketed by the main Sony Corporation instead of Sony Computer Entertainment and does not carry the usual PlayStation branding. Its high cost resulted in poor sales, meaning that the PSX was never released outside Japan, making it a commercial failure. The PSX fully supports both PlayStation and PlayStation 2 software by its slot-loading DVD drive, as the onboard EE+GS chip is a unification of the PS2's Emotion Engine and Graphics Synthesizer chips. Online game compatibility is available using the broadband connection; Games that use the PS2 HDD (such as Final Fantasy XI) are supported as well. The PSX is not supplied with any game controllers, but there are two controller ports on the back of the device. While the PSX is compatible with standard PS/PS2 controllers and memory cards (with the exception of the PocketStation), a variant of the DualShock 2 controller marketed specifically for the PSX was also sold that featured a 4-meter long cord (a bit longer than the standard versions of the controller). Two PlayStation memory card ports were on the front of the PSX, behind a panel cover. Because of the different placement of the memory card slots (which are located above the controller ports on standard PS2 consoles), the PSX is incompatible with the PlayStation Multitap and its PS2 counterpart, and no PSX-compatible multitap was ever produced. Games that require the use of two or more USB ports are also incompatible with the PSX. The PSX was released in eight retail configurations during its lifespan; the 5000 series (with an embossed logo on top and grey stripe at the back) shipped with 160 GB Hard disk drives, while the 7000 series (with a colored logo on top and black stripe at the back) contained 250 GB drives. Software updates were made available by disc and download. The 7500/7700 models added a Ghost Reduction Tuner. The inclusion of BS and UHF/VHF connectors varied by model. Only the final revision of each series supported the PlayStation Portable for video export via Memory Stick (no revisions of this console support PSP games or is compatible with UMD discs). All models have two sets of indicator lights, power lights and Infrared receivers; one along the front for horizontal orientation, and a second strip along the top-back for vertical orientation. The 'Disk Rec' indicator is only on the front of the device in later models. Before being known as the PS1, the first PlayStation console came to be known colloquially by its provisional codename of PSX (this was adopted to echo the MSX, a home computer standard sold by Sony and other companies throughout the 1980s). This can cause some confusion as to which device is being referred to. 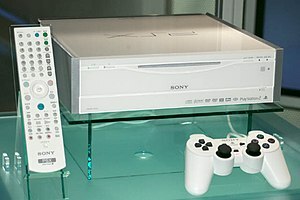 The PSX was initially displayed at CEATEC in white, silver, yellow, red and blue. The white variant was released commercially, with a limited edition silver model made available in 2004. ^ Sony. "PSX DESR-7700 5700 Parts". Retrieved 19 December 2013. ^ "ハードディスク搭載DVDレコーダー"PSX" "PSP"" (in Japanese). Sony. Retrieved January 4, 2010. ^ a b "ハードディスク搭載DVDレコーダー"PSX"" (in Japanese). Sony. Retrieved January 4, 2010. ^ "ハードディスク搭載DVDレコーダー"PSX" Accessories" (in Japanese). Sony. Retrieved January 4, 2010. ^ "ハードディスク搭載DVDレコーダー"PSX" Parts" (in Japanese). Sony Computer Entertainment. Retrieved January 4, 2010. ^ "DESR-7700/DESR-5700 manual" (PDF) (in Japanese). ^ PS-X was an internal code name for the PlayStation during development. The popular use of the "PSX" abbreviation outside Sony became a source of confusion when Sony Corp. ignored SCEA's decision and introduced its PSX digital video recorder in 2003. ^ "Officially announced the Sony PSX, at CEATEC venue". October 7, 2003. Retrieved 18 December 2013. ^ "高度なグラフィックス性能で DVD作成の新しい楽しみを提案する"PSX"発売". 16 June 2004. Retrieved 18 December 2013. This page was last edited on 12 December 2018, at 17:27 (UTC).